Home > National Drugs Strategy 2009-2016: progress report to end 2014. Ireland. Department of Health. 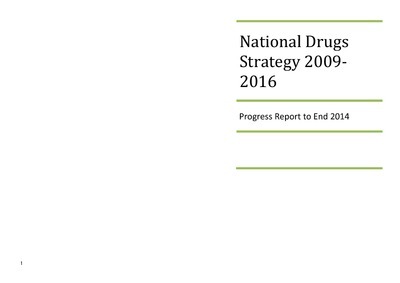 (2015) National Drugs Strategy 2009-2016: progress report to end 2014. Dublin: Department of Health. Drugs misuse continues to be one of the most significant challenges facing our country. It is highly destructive and has devastating effects on individuals, relationships, families, communities and society in general. Implementation of the National Drugs Strategy 2009-2016, which sets out Government policy in dealing with the drugs problem, is being pursued across a range of Government Departments and Agencies. Solid progress is being made across the 63 Actions of the Strategy, which are based around the five pillars of supply reduction, prevention, treatment, rehabilitation and research. The Oversight Forum on Drugs, which will be Chaired by Minister Ó Ríordáin, meets on a quarterly basis and reviews the implementation of the Strategy.